Lea (formerly known as Axel) is a protagonist and former antagonist of the Kingdom Hearts series. As of Kingdom Hearts 3D, he is also a keyblade wielder. Lea is cocky and witty, often joking around with Sora while simultaneously antagonizing him. As a teenager, Lea was very mischievious and competitive, challenging Ventus to a duel as soon as he discovered the boy's wooden keyblade. His competitiveness appears to have carried over into adulthood, as Lea expressed his plans to become a Keyblade wielder like Riku in "no time flat". Lea's home world is the Radiant Garden, where he was best friends with Isa. Before he gained the ability to wield a keyblade, Lea and Axel wielded a pair of weapons called chakrams, as well as control over the element of fire. He also had full control over the Assassin nobodies. 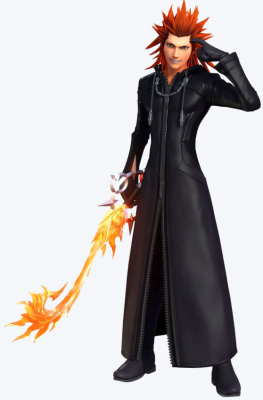 During the events of Kingdom Hearts 358/2 Days and Kingdom Hearts II, Lea was a nobody going by the name of Axel, created when he lost his heart at an unspecified time after the Radiant Garden was overcome by darkness. he was ranked number 8 in the original Organization.